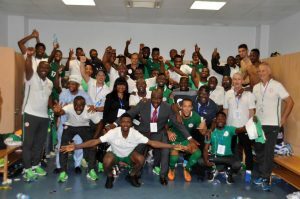 The Super Eagles might have more to worry than the Chipolopolos of Zambia on Saturday’s Russia 2018 World Cup qualifier at the Godswill Akpabio Stadium, Uyo. As youths from the communities where the Akwa Ibom State-owned stadium is sited blocked the gate leading to the complex on Wednesday morning. Apart from accusing the state government of neglect, the placard-carrying youths from Obio Etoi and Obio Ofot said they had not gained anything since the stadium was built on their land. The protesters claimed that neither the state government nor the construction company Julius Berger had fulfilled its obligations in accordance with an agreement they reached between them before the stadium was built. Peters said wastewater from the stadium pumped into the retention lake often overflows its bank resulting in flooding, adding that the lake had become a good breeding spot for mosquitoes. The youths also accused the state government of blocking their only access road to the two communities. The village head of the Obio Etoi, Eteidung Ezekiel Ekott, said the protest was aimed at drawing the attention of the state government to the plight of the communities. The monarch said the state government failed to reply to several letters from his palace reminding them of the plight of the communities. According to him, when it rains, the communities will be submerged in flood waters. He said the communities did not receive any compensation from the state government based on an understanding. “The understanding was that we will get benefits by way of providing roads and drainage,” Ekott said. However, state commissioner of works, Ephraim Inyang, who met with the protesters in company with the information commissioner, Mr Charles Udo, said the road had been earmarked for construction and assured the youths that work would soon commence on the road. The youth leader of Obio Etoi, Mr. Sunday Peters, who led the group, claimed that since 2011 when Julius Berger Plc commenced work at the stadium the villagers had been abandoned.